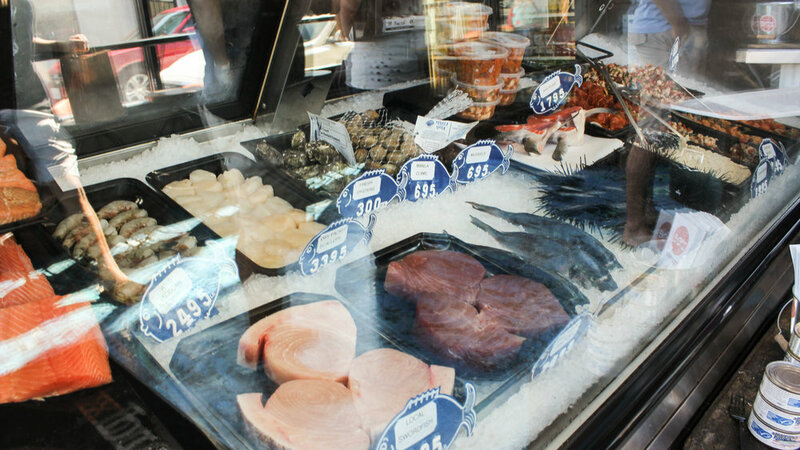 Roe Seafood is nestled right next to the water in Belmont Shore, giving the illusion of a peaceful location, but when you walk through their thick wooden doors you’re greeted by lively chatter and rushing waiters. Behind their kitchen doors there’s chaos as orders are being made, all under the direction of their executive chef Arthur Gonzalez. Gonzalez is the owner and chef for Panxa Cocina, Roe Seafood and Roe Xpress. In those restaurants, there’s the taste of his ingenuity and passion. Gonzalez is a big sturdy man with sleeve tattoos. He almost looks intimidating, but when he starts talking about food there is a gleam in his eyes. He was raised in Cerritos and would help his mother cook German food and his grandmother cook Oaxacan food. He always loved making food but he didn’t realize how passionate about it he was until he became a firefighter and started cooking for his firehouse. He began his restaurant experience in the sink with the piles of dishes ready to be washed. Gonzalez was aware that only working hard would get him where he wanted to be. He traveled to New Mexico and worked at the Hyatt hotel as a chef, but that wasn’t for him. There was something about the adrenaline of a slammed day cooking that took him to Albuquerque, New Mexico where he met his mentor, chef Eric Distefano. He then brought all of those techniques back home to Long Beach. Roe Seafood originally opened back in 2013, but due to insufficient fundings, he decided to try something new and open Panxa Cocina out of his love for Southwestern food. In 2016 Gonzalez decided to open Roe Seafood and Roe Xpress after gaining the support from the community and friends. He wanted to show his love of fish through the restaurant while creating diverse dishes. Roe Seafood creates a fine dining experience, more intimate and casual, while Roe Xpress provides fresh fish and high quality fast dining. “I wanted to be that small neighborhood fish market where you can get a piece of fish with your dad and come back the next day for a cup of chowder,” Gonzalez said. At Roe Xpress the market is there to provide customers with the option to buy fresh fish, but in his cooking he’s also using sustainable sourced grown food. He uses ingredients from Farm Lot 59 which locally grows plants, vegetables and spices. At Panxa Cocina they use chilies locally grown from New Mexico to provide bold flavors. For him it’s more about the flavors and the importance of preserving our food source and animals. “My little restaurant is not going to change the world, but we're at least trying to educate the public.” he said. He explained that it’s about the accountability and knowing that at least the fish in your dish is not over-fished and they’re all accounted for. Gonzalez is busy a man and it’s not easy to track him down. He’s currently involved in helping organize and coordinating the chefs at Music Taste Good, which is an annual music and food festival at Long Beach. He’s also going to be part of the Taste Tent where he’ll provide dishes that incorporate both Panxa Cocina and Roe Seafood. If you don't have tickets, don't worry. His restaurants are located in Broadway and 2nd Street in Long Beach, ready for a visit. There’s no better place to find fresh bold food.